Rooted in the tradition of good craftsmanship, Wieldy can add detail to every letter and make words rich and full of character. Extended serifs connected with dots make new, beautiful but recognizable forms. These are just some of the design features this artisanal font can offer. 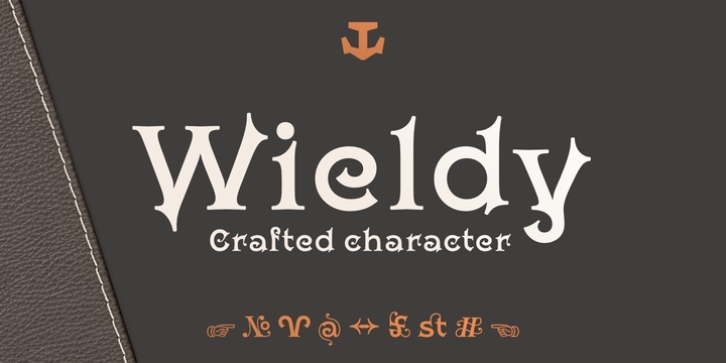 Wieldy is created with great skill and high quality – it is the crafted character. Wieldy typeface is based on the ahistorical forms developed by Central European Arts and Crafts movement. It is designed to be used in demanding projects; visual identities, packaging or book headings. The typeface's x-height is around 72% of its capitals and the serifs are extended and accentuated. The font is enriched with details, ligatures and special characters.